The result was our company's film To Be Alive!, which became one of the fair’s most popular exhibits. More than five million visitors saw the film in the specially built “Golden Rondelle” theater that housed it. Crowds often waiting as long as two hours to see it. Later, it won the 1966 Academy Award for Documentary (Short Subject). To Be Alive! was a perfect example of H.F.’s unique and adventurous vision, cultivated throughout his life, and still alive and well in his family’s company today. When the World’s Fair ended in 1965, The Golden Rondelle Theater was dismantled and transported to Racine, Wisconsin, home of SC Johnson’s global headquarters. The building was redesigned by Taliesin Associated Architects to fit on our Frank Lloyd Wright-designed campus. Today, it continues as a theater for company and public events. 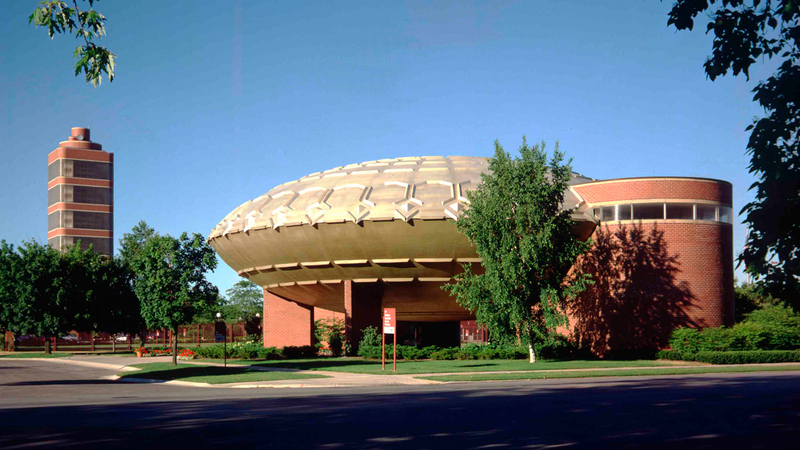 The Golden Rondelle Theater in its permanent location on the SC Johnson global headquarters campus. To Be Alive! can be seen at The Golden Rondelle Theater in Racine as part of our headquarters campus tours. Reservations are required, and our tours and films are free for visitors.